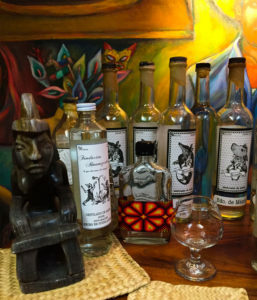 Almamezcalera and Mezcalito Pal’alma are mostly unavailable outside of Mexico. Certain releases can occasionally be found under the prestigious Wahaka VdM label, but there aren’t any other legal importers that we know of, and the Wahaka VdMs are all limited releases that can be hard to find. We’d seen Almamezcalera and Pal’alma bottles online, and occasionally we’ll run into a bartender who will talk about having a bottle in their private collection. For us, these two brands, as well as their owner Erick Rodriguez, were more myth than anything else. In addition to being what many agaveholics consider the world’s best mezcal, there’s a bit of mystery around Erick himself. He’s both a jet-setting, world-traveling agave ambassador and the local Indiana Jones of Mezcal all at once. Before departing Austin, we asked our social network for mezcaleria recommendations near where we were going to be staying in Mexico City. Several people responded within minutes. All of them had the same advice; “go see Erick.” Just before our flight took off, I messaged Erick to see if he was available. I hoped that we’d get a chance to talk to him, but wasn’t sure if he had a tasting room, a shop, etc…We didn’t really know what to expect. Our plane landed in Mexico City two hours later. My phone connected to the network and I received several missed messages from him, asking when we’d be able to visit his tasting room. Our taxi dropped us off near Erick’s and we found him in a bottling room that opens into the street. The small room was packed with 750ml bottles and several larger 5+ gallon glass containers that rested on the shelves behind him. He was placing labels on some bottles when we arrived. After quick introductions, he shuffled us to another room across the street. This second room was also filled with large glass containers of unbottled mezcal. It also had some interesting pieces of art, a few chairs, and his Xoloitzcuintli dog. If you don’t know the Xolo dog breed, check them out. They’re super friendly and…well…almost completely bald. We chatted and sipped herbal mezcal infusions for maybe 30 minutes before we moved to the actual tasting room, which was located back across the street. The room had dozens of Almamezcalera and Mezcalito Pal’alma bottles out on the bar. 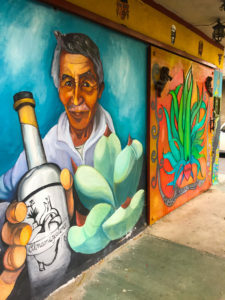 The walls were colorfully decorated with landscapes and portraits of mezcaleros. Erick walked us through a tasting of most of his current line of 58 (soon to be 61) mezcal varieties from across the country. Unlike most other brands, Almamezcalera is from both inside and outside Denomination of Origin (DO) states. Because of this he can’t legally call all of it “mezcal.” He uses the terms “Destilado de Agave” and “Aguardiente de Agave” on his bottles instead. Before each pour, he explained the bottle in great detail. These explanations included where it was from, the processes used, and his personal history with each mezcalero and town. Among the highlights was a mezcal made from a 55 year-old Karwinskii agave that we’d never heard of. These Karwinskiis had grown to a height of 3.5 meters at the time of maturity. The mezcal had a rich, smoky experience on the palate, very similar to a fine cigar. He had more mezcal infusions, including some made with lemongrass, and a chivo made with mole. This chivo had strong notes of dark chocolate, jalapeno, and smoked goat meat. He also had several bottles made with agave Espadilla from Puebla, including some pechugas that were out of this world. The ABV on all the bottles ranged from 48-65+ percent, and I didn’t see a single batch larger than 99 bottles. In addition to the incredible mezcal, we also learned more about Erick’s explorations through Mexico. 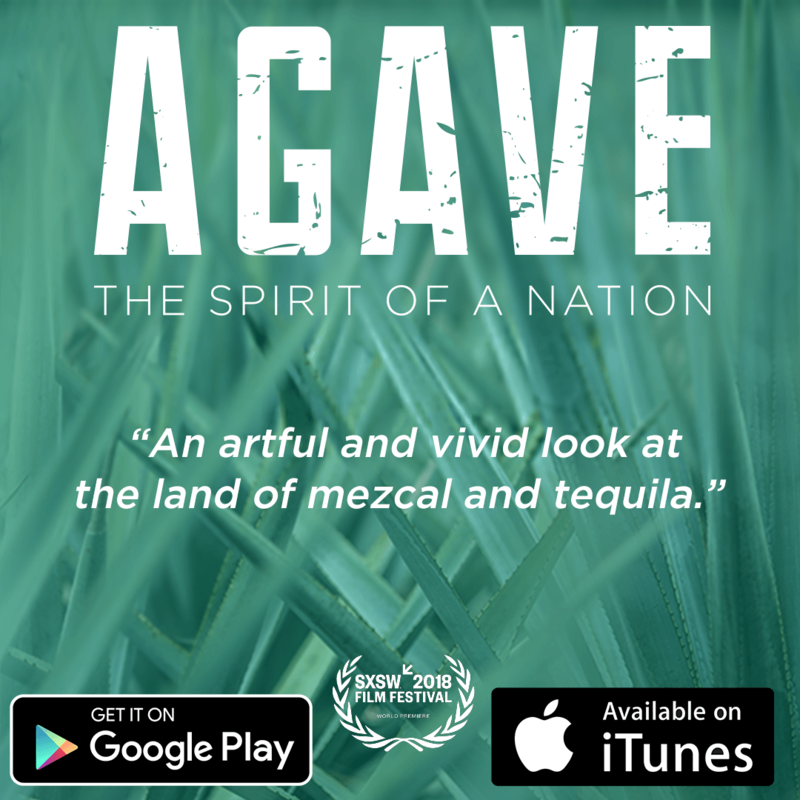 He travels through 20+ Mexican states in search of some of the world’s best spirits. Anywhere he finds agave fields and a freshwater stream, there’s a good chance that someone is making mezcal nearby. He showed us some jaw-dropping agave photos, and lots of pictures of the mezcaleros he works with. Hearing him describe these people and landscapes really puts the passion behind his brand into perspective. These mezcal-finding expeditions also allow him to collect some very old and rare artifacts. He showed us ancient clay stills, broken pots, mallets, and other generations-old parts that he had lying around the tasting room. 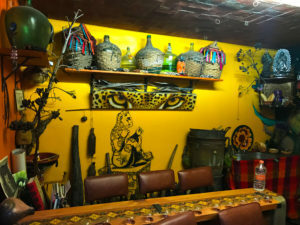 At one point he even gathered a handful of broken pieces of clay pots and proclaimed that they “belong in a museum,” which only adds to the Indiana Jones of Mezcal myth we’d heard before visiting his shop. Make sure to eat a large meal before visiting Almamezcalera. We had skipped dinner, which caught up to me quickly. Erick took orders for the bottles we wanted and actually gave us a ride to one of his favorite restaurants. We stayed out for a few more drinks before heading back to our Air BnB. Early the next morning, we hit the road to Oaxaca. We went back to Erick’s a week later to pick up our bottles. He had graciously wrapped them for us so they wouldn’t get damaged in our luggage. All said, Almamezcalera, Mezcalito Pal’alma, and Erick surpassed all expectations. Even after a week in Oaxaca it’s hard to argue with him when he says that he carries the best mezcal. His bottles are amazing and his passion for the craft is contagious. Very interesting story to read. I’m envious of your visit. Looking forward to reading more blogs about the trip.